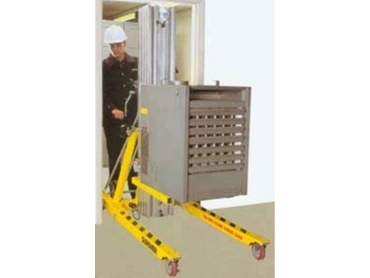 With the Series 2000 Material Lift, from Spacepac Industries , one person can easily move, lift, and reposition heavy loads – from computer and appliances to steel beams or manufactured parts. Compact and portable, it lifts up to 455 kg (1003 lbs) to a height of 3.2m (10.4 ft). The quiet, high-speed reversible hoist quickly lifts and lowers heavy loads with its superior cable system and mast design. The shorter mast section allows travel through standard doorways and tail gates hassle-free and without tripping. Mounted on top of base, the fast-action stabilizer legs fold down with ease and lock in place. This means compact storage and loads nicely into vehicles with small storage space. With no tools or loose hardware to worry about, this durable, corrosion-resistant unit is easy for one person to use and maneuver. An added function of the lifts are the reversible forks. With a quick pull of the plunger pins, forks can be repositioned for added height or to position load flush with the ceiling. The Series 2000 Material Lifts are equipped with a loading bar for transport by an overhead crane. The lifts can be easily transferred between floors or onto open bed trucks.